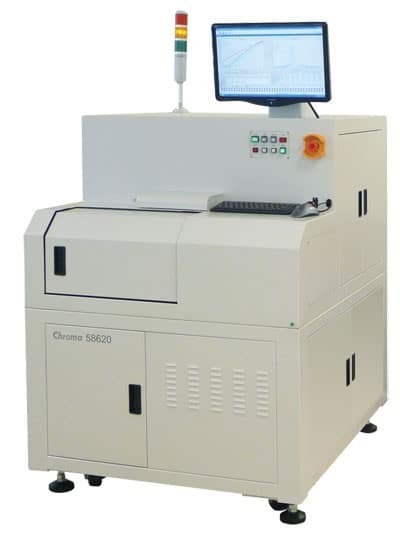 The Chroma 58620 Laser Diode Characterization Station is a state-of-the-art full turnkey system designed specifically for Laser Diodes. Its features range from macro inspection of the facette or aperture active area, to a full suite of electro optical parametric tests. When Chroma’s high capacity carrier is used, multiple devices can be rapidly and repeatably indexed, improving not only test times but the reliability of the tests themselves. Chroma’s high precision carriers can be adapted to suit multiple form factors such as Chip on Carrier, Submounts, or Laser-Bar’s. The innovative bi-lateral design is symmetrical with components placed on both sides to allow for a larger volume of components. The carrier is multi-layered to allow for components to be easily placed in their respective pockets yet secured once the other layers are mounted. The thermal interface structure allows for efficient component thermal contact along with a high degree of temperature control during heating and cooling cycles. At the touch of a button, an operator can perform full-scale automated testing once a carrier has been inserted. One of the primary uses of high performance laser diodes are in the fields of optical data and telecommunications where the requirements for fiber coupling are quite stringent. If most DC parametric and optical characteristics are understood before a laser diode is inserted into the final product there is a greater cost saving and higher degree of in-field reliability. Highly accurate TEC temperature controller with stability up to ±0.01?